Our best selling mitten. 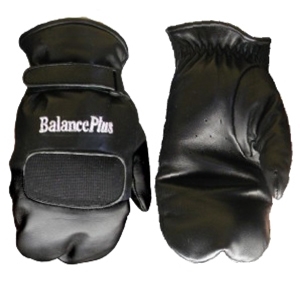 The BalancePlus mitt is made of insulated Full-grain leather for superior grip Vent holes in palm Adjustable wrist strap. The perfect solution for those who just need a little extra warmth while on the ice. I love the warmth of these mittens and the stick leather when sweeping. The bigger issue I have with these mittens is my down hand( low hand on the broom, right hand) when sweeping had torn in the palm and thumb stitching area. Both my pairs tore, the newest pair tore after 3 months of play which is 60 percent skipping and 40 percent vice. I would not recommend these mittens if you sweep hard or play frequently.